Chase Dominic Johnson is 22 years old and calls Penngrove, CA home. 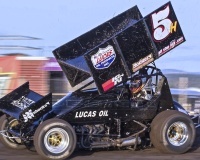 The Northern Californian currently races 410 and 360 winged and non wing sprint cars, Midgets and Outlaw Karts. His schedule varies as he competes across the country but the majority being on the west coast . Chase is a 4th generation racer, 6 time Outlaw Kart Champion and a 360 Winged Sprint Car Champion. Behind the stats of 300 plus main event victories, and the 7 championships, Chase stands out from all his competitors with his qualities and skills that define him as a Champion. What separates Chase far from all other drivers in the world is his story. Chase's story begins on March 16, 2013 which was his families teams opening night of the 2013 season. In the first practice session of the night, the steering wheel in his sprint car malfunctioned causing him to lose control of the vehicle. He crashed, uncontrollably out the exit gate of the race track and his car struck and killed his 14 year old cousin Marcus Johnson and another gentleman, Dale Wondergem Jr. who was a 68 year old car owner. After the accident he was absent in all of motorsports. After many long months he made one tough and courages decision to return to racing. He chose to race in honor of those lost in the accident, Marcus and Dale. He now strives to be successful as a racer but also be a strong inspiration to anyone that might have a tough time overcoming a difficulty in their life. Outside of his racing he is a student at Sonoma State University, majoring in Business Management. He also has an associates degree in Business Administration. Chase also aims to be a good role model and an inspiration to others going through tough times. The sport of racing has made him who he is today and he feels that he should help give back to the sport that has helped him in so many ways. 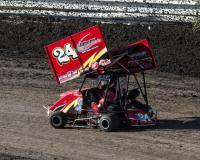 Chase fell in love with the sport of racing at the age of the 5 in the Outlaw Kart ranks where he progressed and made the step into a sprint car at age 14. Now at age 22 he has competed at some of our sports most prestigious events like the Chili Bowl Nationals, Knoxville Nationals, Gold Cup, Oval Nationals, Turkey Night and Trophy Cup. He has raced Outlaw Karts, Quarter Midgets, Road Course Go-Karts, Micro Sprints, Midgets, 360 and 410 Wingless Sprint Cars, 360 and 410 Winged Sprint Cars. He is a die hard racer who will race in anything and everything. In 2018 Chase will be competing in 80 plus events on the West Coast. The majority of those races will be in a 410 Winged Sprint Car. Returning to the seat of the Thomas Family Racing 68, Chase will compete for the championship in the King of the West Series and along with World of Outlaw events in California, a dozen USAC 410 Non Wing events, and the prestigious Knoxville Nationals. This year Chase will also be driving for Vanlare Racing, an established and well known team out of the Santa Rosa area. In the Vanlare Racing 5v, Chase will go after the championship with the Sprint Car Challenge Tour along with some of the biggest races 360 Winged Sprint Car races in California. Along with Sprint Car racing in 2018, Chase will return back to Midget racing with Morris Motorsports, where they will run a handful of races during the season as well as the prestigious Chili Bowl and Turkey Night Grand Prix. Rounding out this season, Chase will compete in the Outlaw Kart ranks with McClish Motorsports. Their schedule ranges from outdoor venues like Cycleland Speedway to indoor venues during the winter months. Besides driving for these great teams, Chase will also drive the families 360 Winged Sprint Car in a handful of 360 sprint car events in the state of California.